He might turn into a prince, and he's WAY too cute just as he is! Princes may be charming in the beginning, but they have a way of turning into grouchy old kings--just ask any princess. Don't say we didn't warn you. Lock him away in a glass cabinet if you have to! 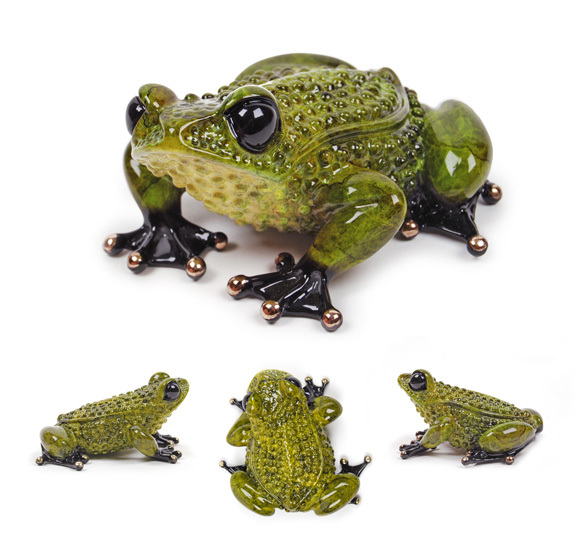 "Prince Charming" is an incredibly appealing sculpture--covered in lumps and bumps, with a beautiful variegated green patina that gives him a very realistic, 'toady' look. Completely unique, totally charming--absolutely Frogman.